An underwater glowing stream – how to make brainless, immobile, toothless filter feeders look a bit cooler for a few seconds? Galway, and CEFAS, organised a cruise to study deep-sea sponge aggregations in Irish waters. Many ROV dives collected an important video bank and we used fluorescein dye to carry out the first crude assessment of the pumping rates of deep-sea sponges in the Atlantic. They harbour a high taxonomic and functional diversity. They are habitat builders, providing feeding, breeding and nursing grounds for other species, increasing local density and diversity. Sponge grounds are likely to play an important role in the deep ocean ecosystem but very little is known about their biology and distribution. Many examples exist in the world like the “Ostur” grounds (literally meaning “cheesy bottom” in the Faroese language) in the northern Atlantic and the Arctic Ocean or the glass sponge reefs in British Columbia. Eastern Atlantic waters from Morocco up to Scotland and Iceland are inhabited by the hexactinellid sponge (also called glass-sponge) Pheronema carpenteri (Thomson, 1869) nicknamed the “bird-nest sponge”. This species has been known since the late 16th century, discovered by the H.M.S. Challenger expedition. Renamed several times since then, it has been found from the mid-Atlantic ridge to the south of Iceland, in the region around the Azores and in the Mediterranean Sea. Functionally similar sponges have been seen on the Brazilian margin, in South Africa and in the Indian Ocean. Despite a very broad distribution in the North Atlantic, which implies an important ecological role in this region, our knowledge of its biology is restricted to its morphological description and a few hundred known specimen locations. The areas where they are present on the Porcupine Sea-Bight have been trawled for deep-sea fish in the past and the level of direct damage that can be caused by a net on such a fragile habitat is easy to imagine. 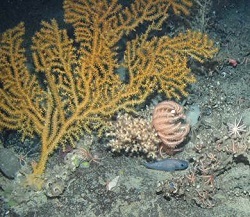 What is less well understood is how the sponges might respond to longer term disturbance, how they would be affected by sediment resuspension, how long it will take to recolonise the areas where they have been removed, and how the loss of extensive sponge grounds could affect the deep ocean ecosystem in general. Studying physiology requires regular measurements to be conducted on the same animals in known environmental conditions. This is usually impossible to achieve in nature and thus is done in a lab tank. Currently, no attempt has been made to keep P.carpenteri in a tank so their metabolic requirements (temperature, oxygen, amount of food…) are unknown. Thus, one of the secondary objectives of this cruise was to try to bring back live sponges to Plymouth Marine Biology and Ecology Research Centre and try to maintain them alive. P. carpenteri lives at around 1200 meters depth, on flat, muddy ground. Sometimes forming very dense aggregations (1.53 individuals per meter square have been reported in the Porcupine Seabight). It is the dominant benthic filter-feeding species there but there are other sponges living among the Pheronema, like the stalked sponge Hyalonema (and almost nothing is known of their physiology either). We know that these sponges process silicon to make spicules just like any hexactinellid, and it seems the sponge grounds trawled in the 1990’s in the Porcupine Seabight may now have recovered suggesting their life cycle is a matter of years or decades as shown by Rui Pedro Vieira (NOC) in recent work. But while the study of the metabolism of shallower (e.g. easier to access) sponge grounds have received more attention recently, there is currently no way to estimate P.carpenteri’s contribution to the global cycle of nutrients. Sponges pump water and that is pretty much all they do. Shallow water sponges are filtering huge quantities of water and their deeper relatives are likely to be doing the same. But there is no quantitative estimate of their filtering capacities. Many biological processes are known to be slower in the deep sea and one can reasonably argue that as pumping consumes a lot of energy, it might be reduced to minimum in deep-sea sponges. To try to assess the importance of the flow, and see if there is any flow at all, we used a tried and tested method often applied to shallow tropical sponges: dyed water. The principle is simple (see figure 3) and there are many examples on Youtube (https://www.youtube.com/watch?v=m8a0oNsDEx8 ) of divers injecting sponges with fluorescein making the sponge produce this beautiful green stream of dye in the water. See if they are alive (assuming a sponge that doesn’t pump is a dead sponge) in situ or in a tank. Assess their pumping rate in order to estimate how much water they filter and how much they contribute to the general cycle of nutrients in the ocean. Produce high quality footage to inform and publicise our findings. Fluorescein is an environmentally harmless dye, that is widely used in many different ways (on humans as well). It has the advantage of being easily transported in a concentrated form and then diluted with sea-water so it is the same density as the water pumped by the sponge which allows it to flow normally through its body. The ROV present on the Celtic explorer (named Holland I) is equipped with a hose and a syringe previously used to squirt some anaesthetic at fishes so they could be captured. The device was devised by Patrick O’Driscoll at the Marine Institute in Ireland. We filled it with diluted fluorescein and mounted on the ROV as shown in figure 4. Figure 4: The fluorescein squirting device. Note that operating this device with the arms of the ROV is pretty hard going! Particularly when trying not to stab the sponge with the end of the syringe. Luckily, the ROV pilots are talented and after a few failed tries we obtained this beautiful footage of Pheronema and Hyalonema pumping water. We used the same process to check if the sponges brought to the surface and kept in a tank were alive. None of the sponges we brought to the surface ever pumped any fluorescein. The most likely reason is that they were dead. Many factors in the retrieval of the sponges could have resulted in death; direct physical damage, clogging by mud, temperature change or exposure to air and light. We speculate that P.carpenteri might be able to shut down pumping if they are physically disturbed, as we noticed in situ. This could indicate that sponges can quickly respond to physical stimulus and are less passive than one would think of an animal without brain, muscles or even the most basic neural system. Although very limited in scale, this experiment is a first and we would like to reproduce it. It also showed that we are still unable to keep these sponges alive once brought to the surface. This has opened-up several questions that would need further investigations in the future. We are hoping to make this the base of a more comprehensive study of deep-sea sponge metabolism and their capacity as nutrient recyclers. There are many ways to make this sampling more effective and informative in the future, for example, using an Acoustic Doppler Current Profiler (A.D.C.P.) would allow us to accurately measure the pumping-rates we observe.